We'll pick you a new favourite. 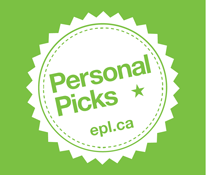 We love books, music, movies and video games—and we can help you find stuff you'll love too! Let us know what you're into by filling out the form below. We'll create a hand-picked list just for you. Get a personalized combo pack of different formats (books, music, video, video games—whatever!) on a particular topic, theme, or mood. ▲ Please tell us what you would like. Selections will be based on the library's audience classifications. ▲ Please click the checkbox.